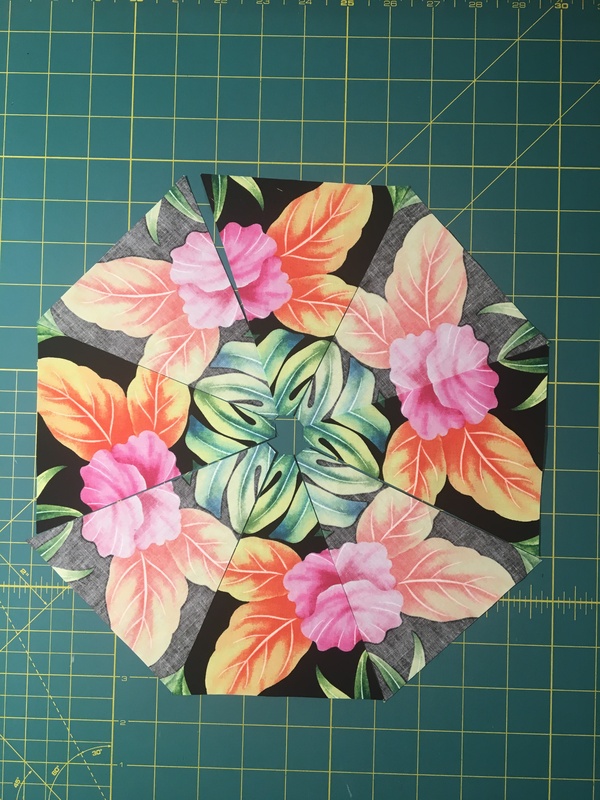 I have been having too much fun making kaleidoscope blocks lately. Every time I look at a fabric now I am wondering how well it might work for kaleidoscope blocks. 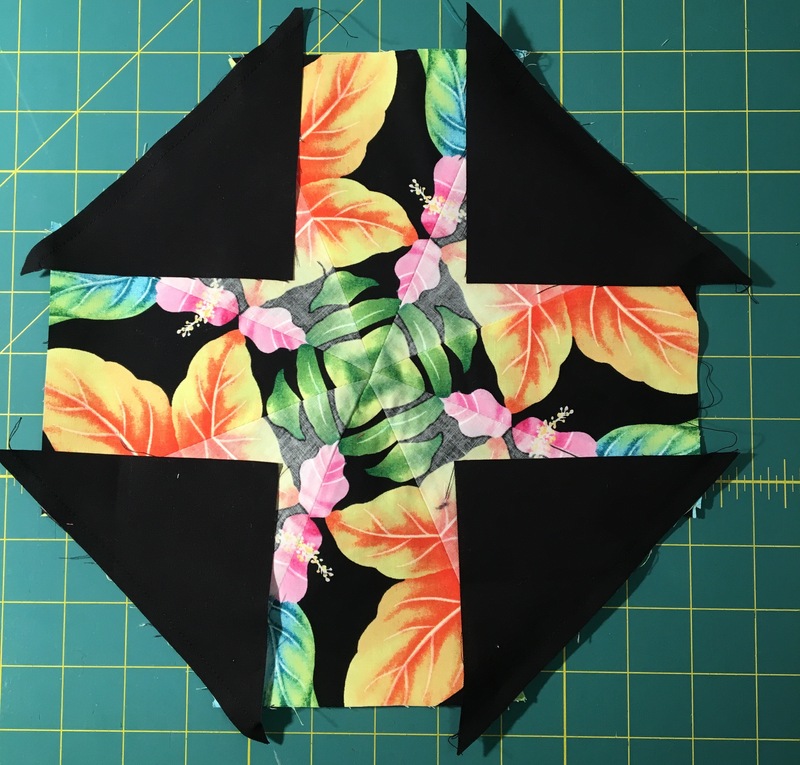 Bethany Reynolds has books on this technique which includes patterns for blocks with 45 degree triangle quilts as well as 60 degree triangle quilts, and she also includes patterns using diamonds and half square triangles. Her books are Stack-n-Whack and Stack-n-Whackier. Check out your local quilt shop to see if either is available. They might even order a copy of them for you. Or you can just make some blocks and create your own quilt or quilts with them. 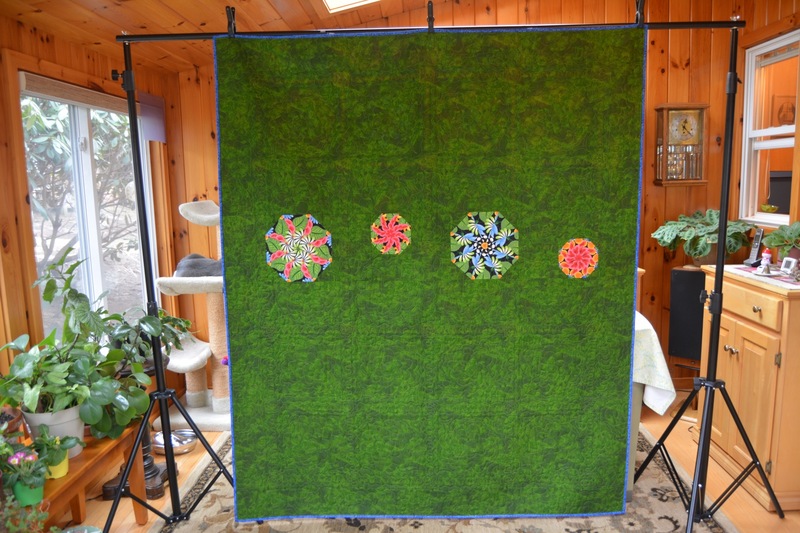 This week I will be sharing my enthusiasm at Quilters Common in Wakefield, MA. I am teaching a workshop on the process for making these quilts. 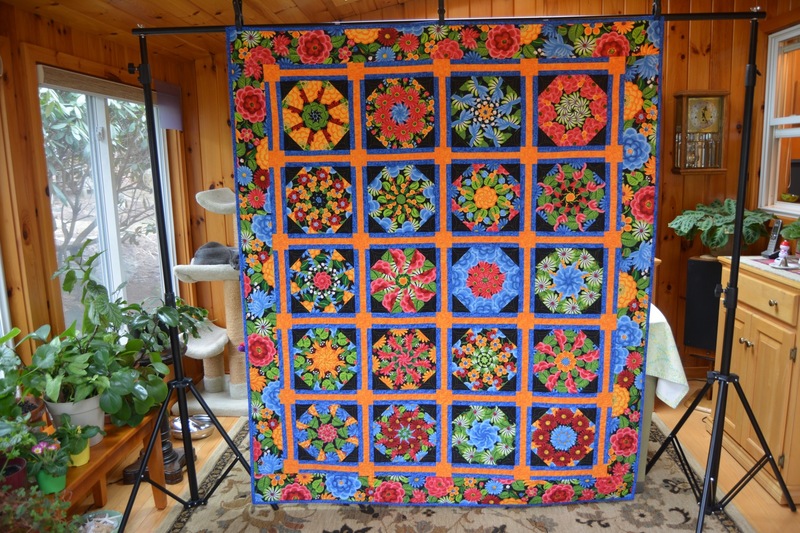 I also have a pattern available for this quilt which is available exclusively at Quilters Common. Here is a quick rundown on the process. I like to look for fabrics with large prints that have different shapes and colors. 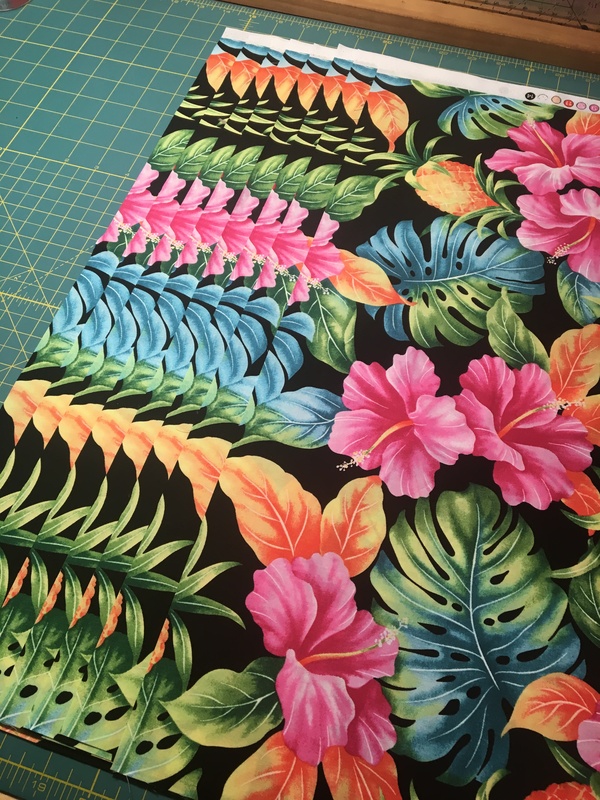 You need to pay attention to the repeat of the design on the fabric. 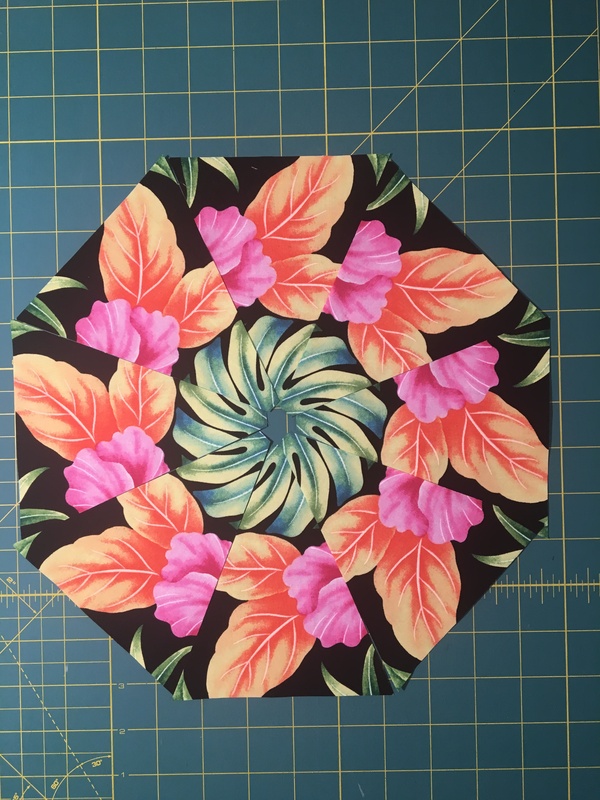 You can work with any repeat, but I have found that I like working with a 24″ repeat, which is usually pretty standard with the larger print fabrics. 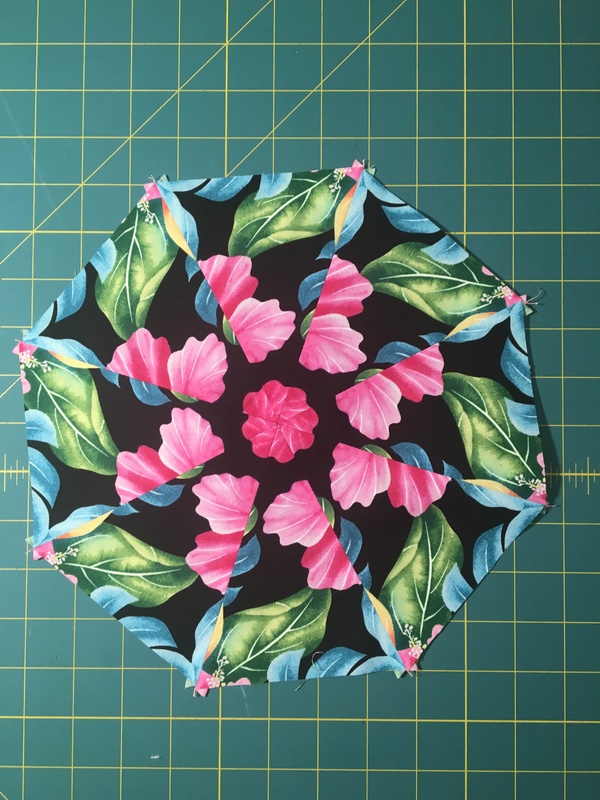 Since the classic Kaleidoscope block consists of 8 45 degree triangle blocks, you need 8 repeats of the fabric. 8 times 45 is 360, which gives you a full circle! 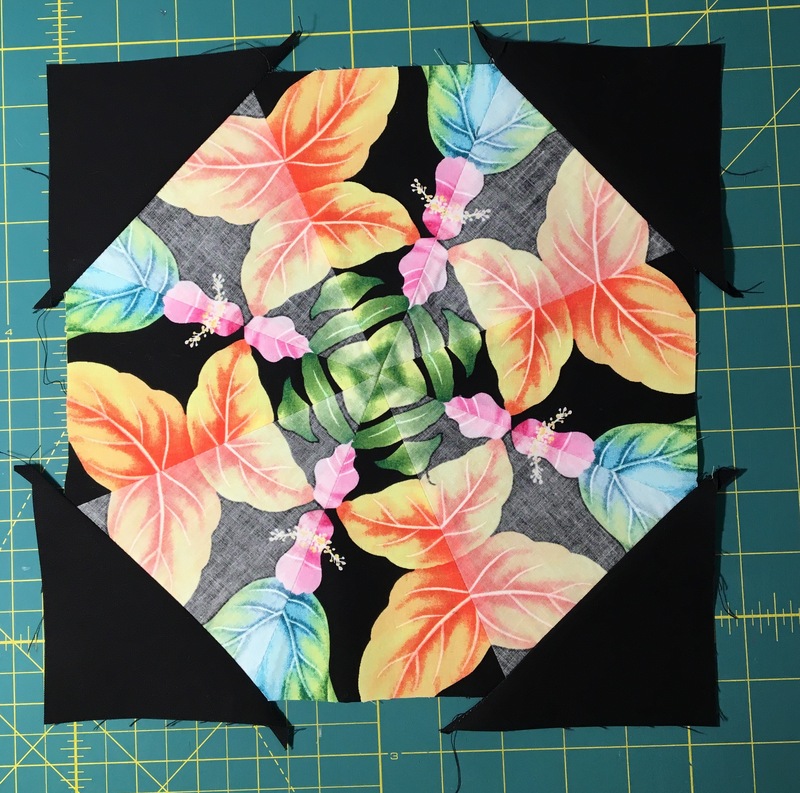 Plan on buying at least 5 1/2 yards of fabric of your kaleidoscope fabric. The first thing I do is cut my fabric in half lengthwise. 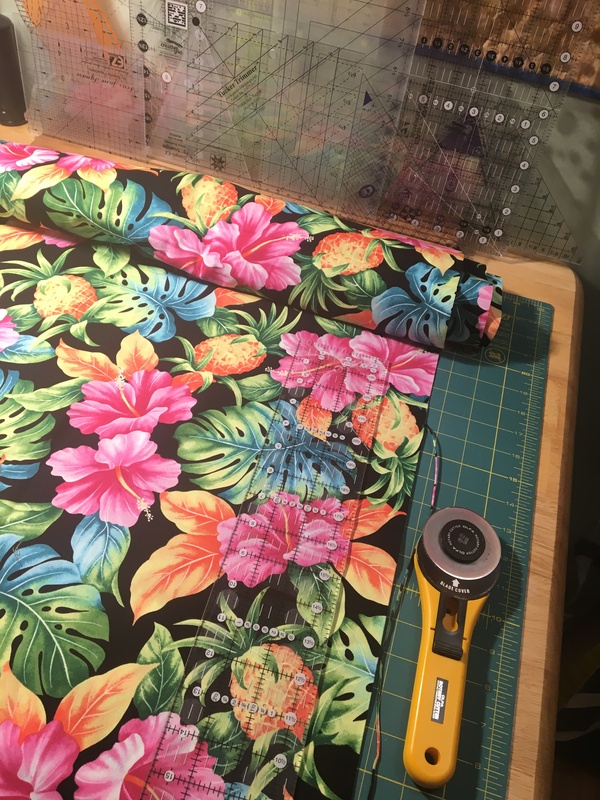 This way you will be working with half of the width of fabric and this will allow you to have some flexibility with your fabric. 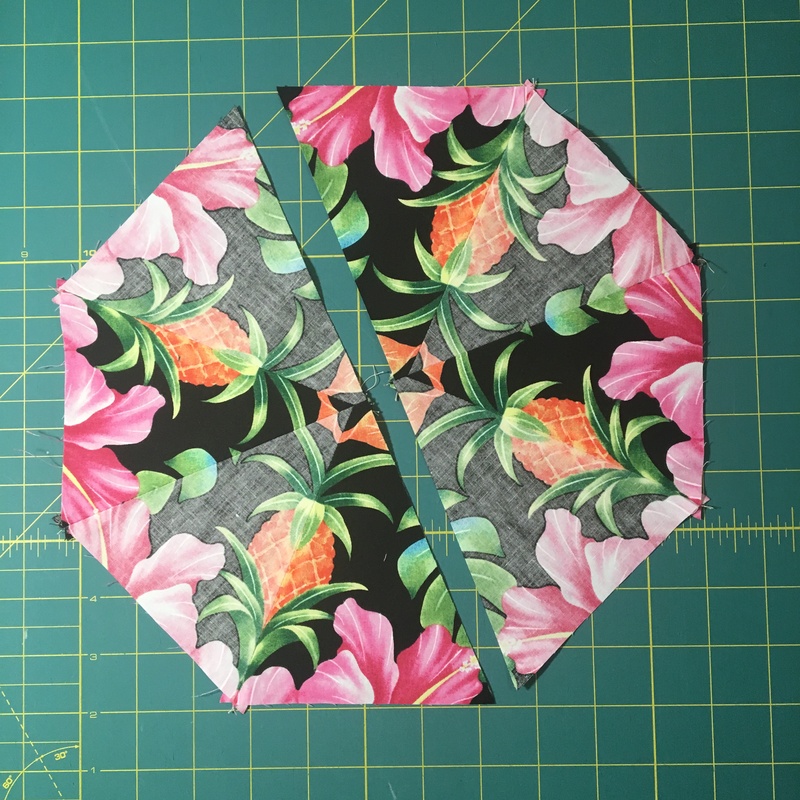 You can either set up two sets of repeats of the fabric for cutting triangles, or you can use the other half of the width of fabric for length of fabric borders. 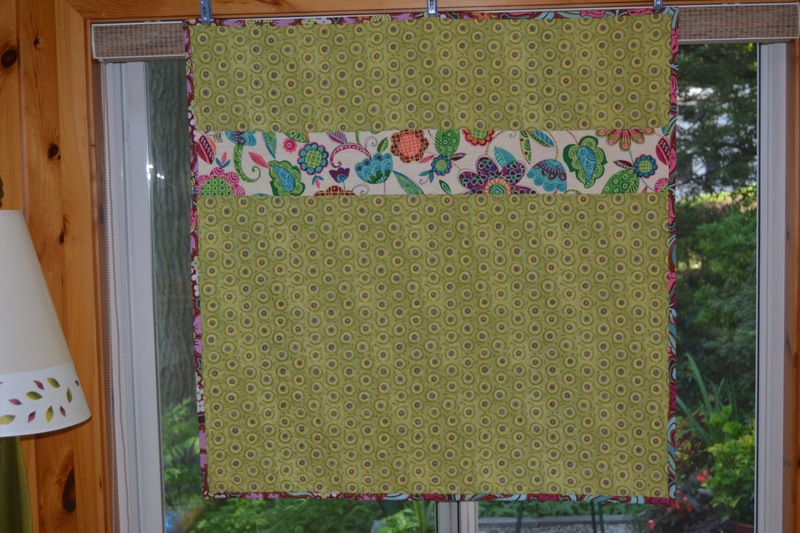 What you do with the fabric depends on what you have in mind for a quilt. 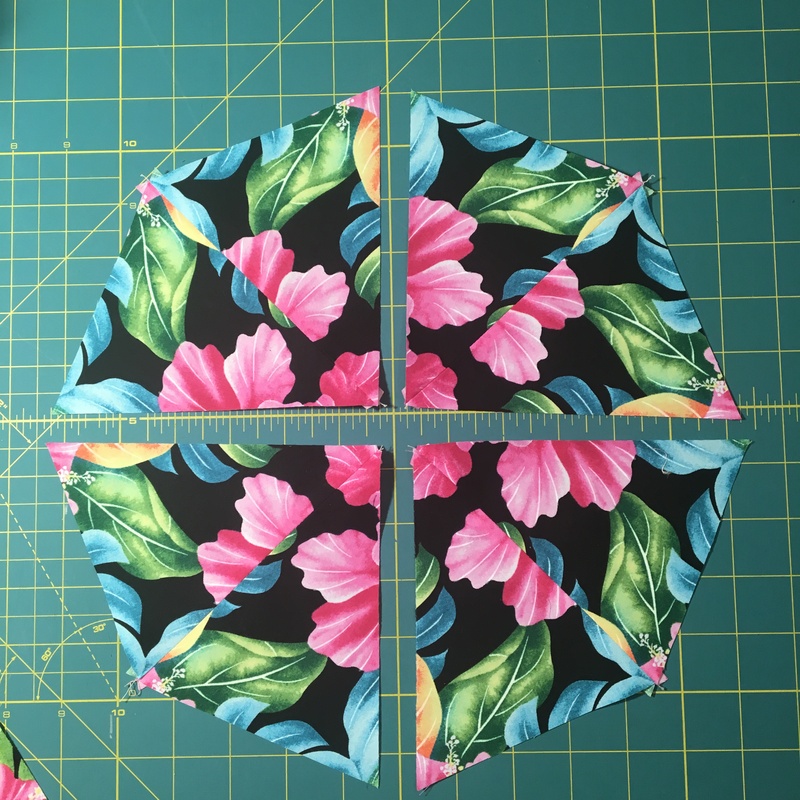 You can snip and rip your fabric down the length or carefully rotary cut it. To do this I just rolled the fabric as I went to keep it out of the way. Snipping if faster and more fun, but it may pull at the threads in the fabric, so don’t do this if your fabric is not a robust weave! (As you view the photos in this article remember you can click on each to enlarge it.). Layer the 8 repeats on your cutting board with the salvage on top. 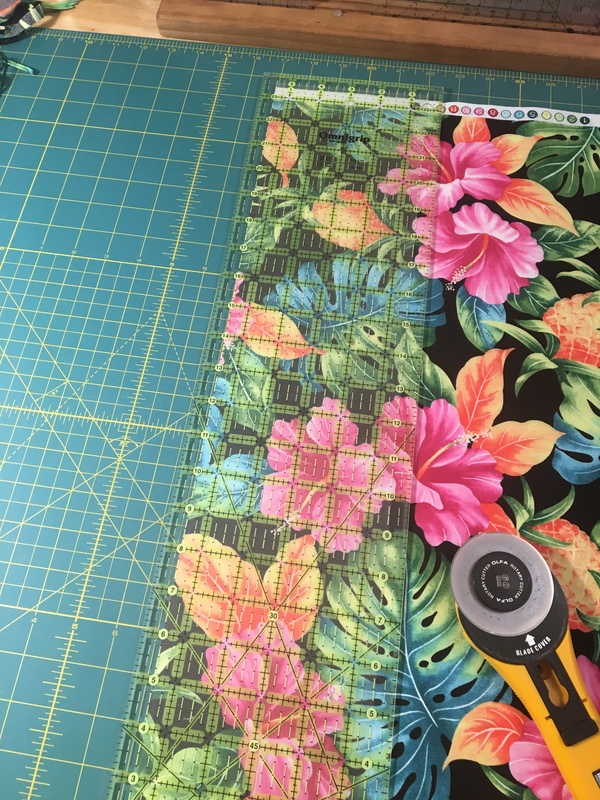 The next thing to do is to carefully cut eight repeats of the fabric. Each piece should be about 22″ x 24″ and they all should be pretty much the same. 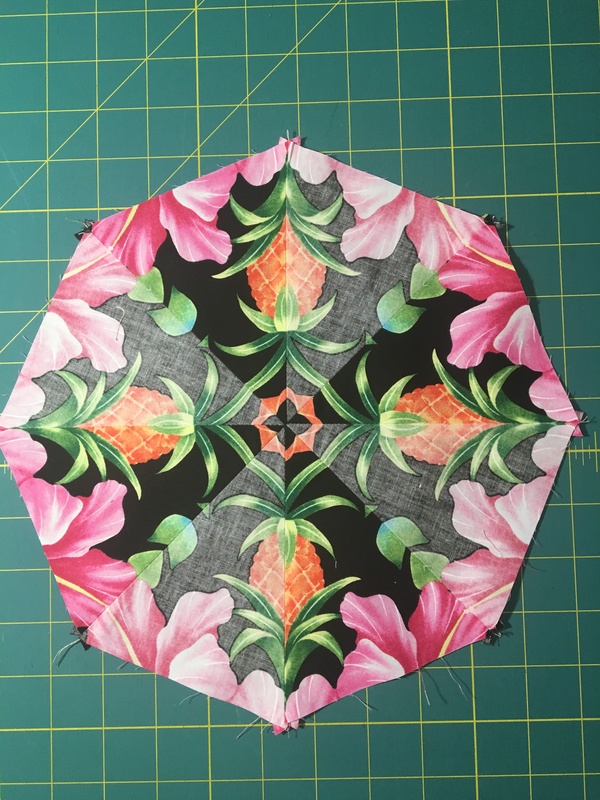 Once you have all eight repeats cut, layer them and match them up by placing a pin through the same spot in all eight layers. Secure that area that you have pinned by placing a second flat head pin in and out of the eight layers. Repeat this process with a few pins about 2″ in and each about 3″ apart from the side of the layers of fabric. Once you have the pins in place you can take a look at the edge of the layers to see how well lined up they are. Make some adjustments by repining if necessary. If everything is lined up then go ahead a cut one strip of fabric for your blocks. 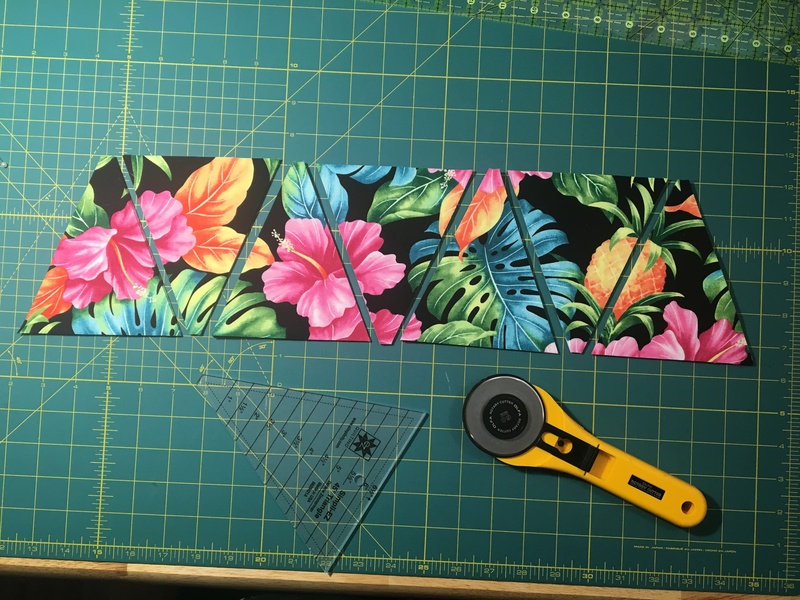 For my pattern I cut 5 1/2″ strips. Next cut the triangles. 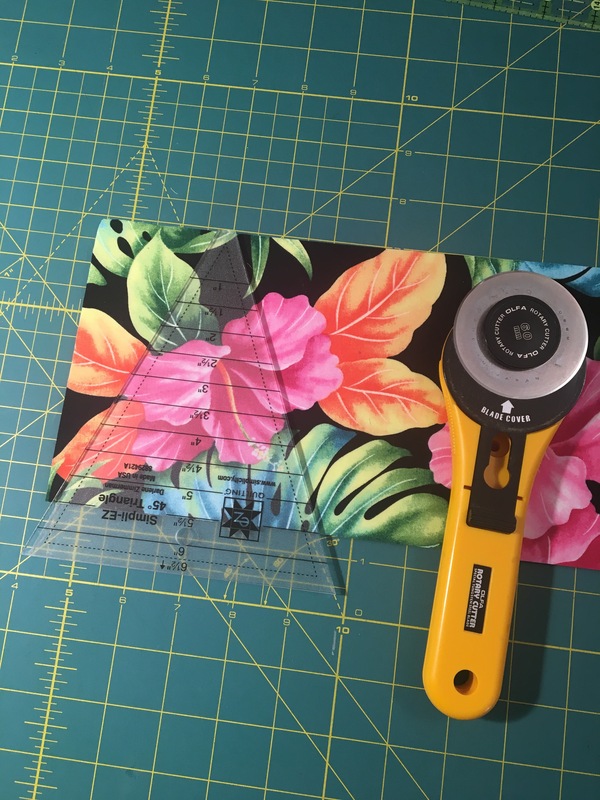 Bethany provides paper templates in her book, but I like using a 45 degree acrylic ruler. Mine is the Simpli-EZ Ruler by EZ Quilting. 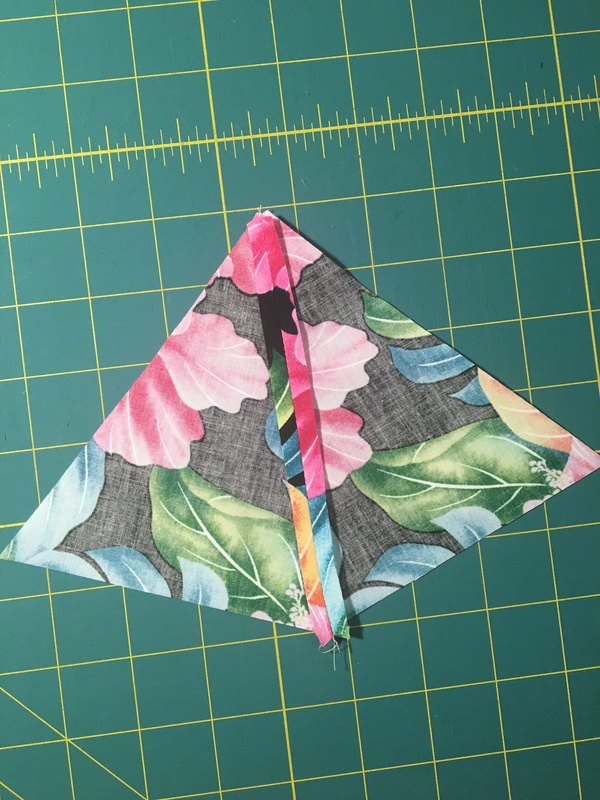 You should get 7 sets if triangles from each strip of fabric. 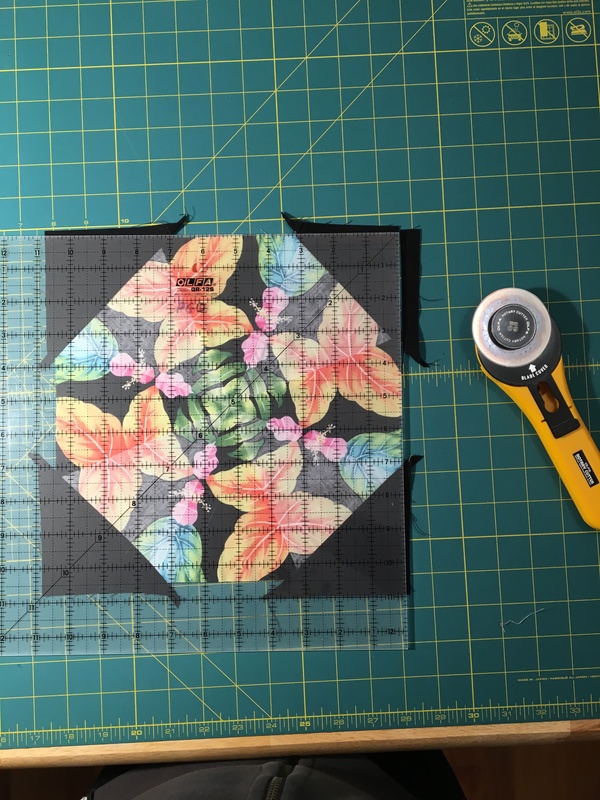 Cut through all eight layers at once. Be sure you have a new blade in your rotary cutter. I like using a larger 60 mm cutter because you get better leverage and a quicker cut. 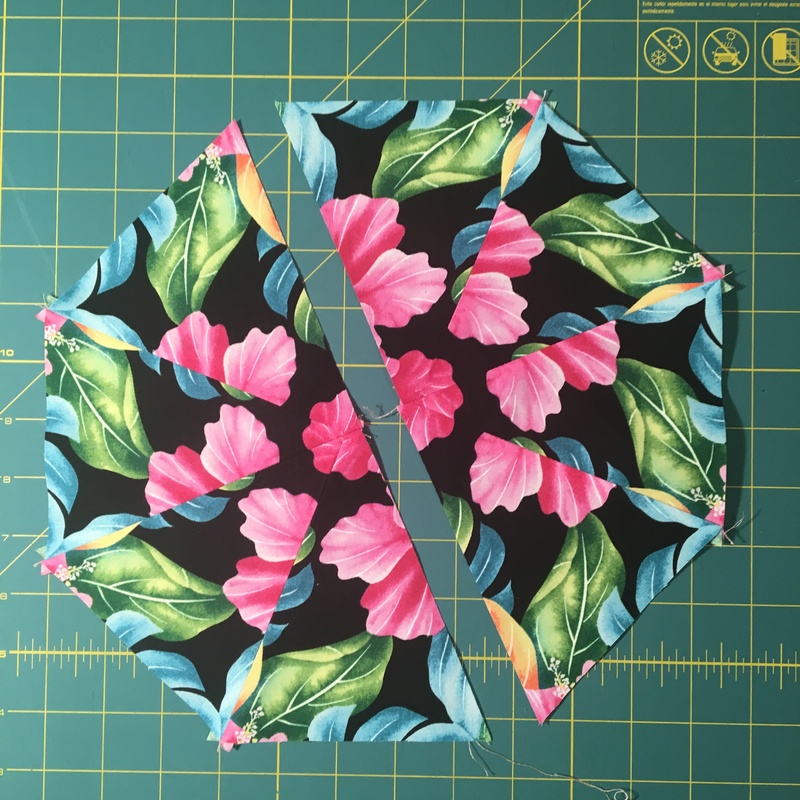 Next step is to sew your triangles together. First sew four pairs, then two pairs together and then the two halves together. Consider trying this! If the back of your fabric is suitable you can achieve a mirror effect by alternating the back of the fabric with the front! To do this sew each set with both pieces right side up. 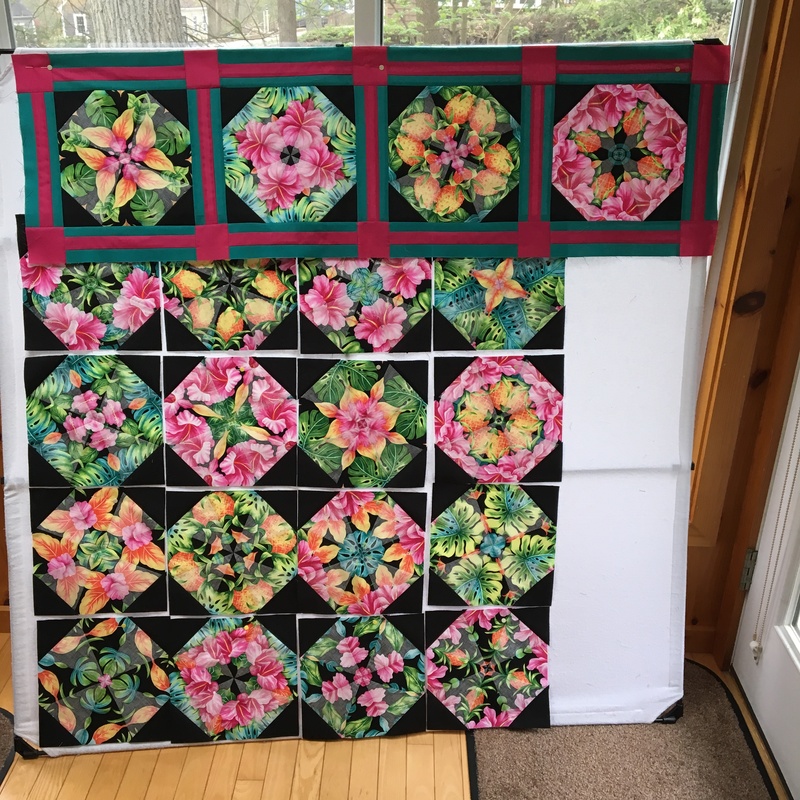 These two photos will give you an idea of the difference between using all of the right side of the fabric and a block with every other triangle with the reverse of the fabric. The same set of identical triangle pieces were used for both photos. Both are beautiful! Which would you use? To finish the blocks I cut two 4 1/2″ squares for each blocks and then cut them once on the diagonal. Then I sewed each half square triangle to the corners of the blocks. The triangles are over sized so that you can trim the blocks to the correct size. 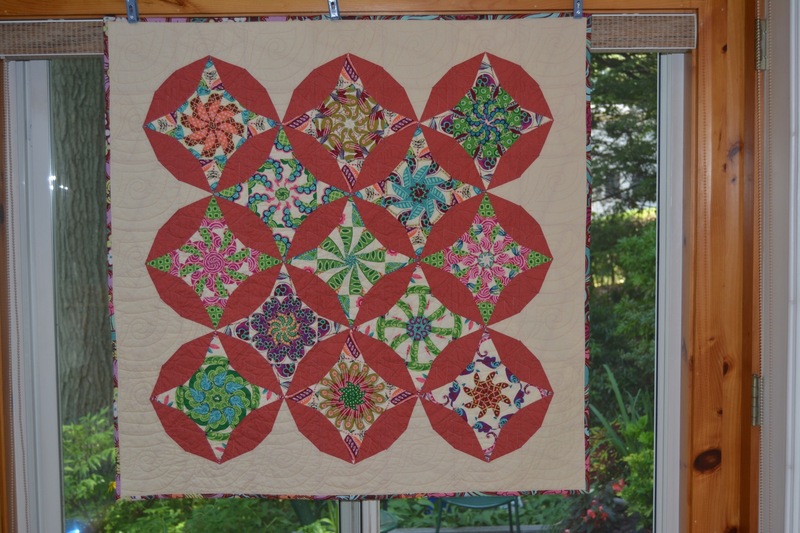 And here is another finished version of the same quilt pattern. 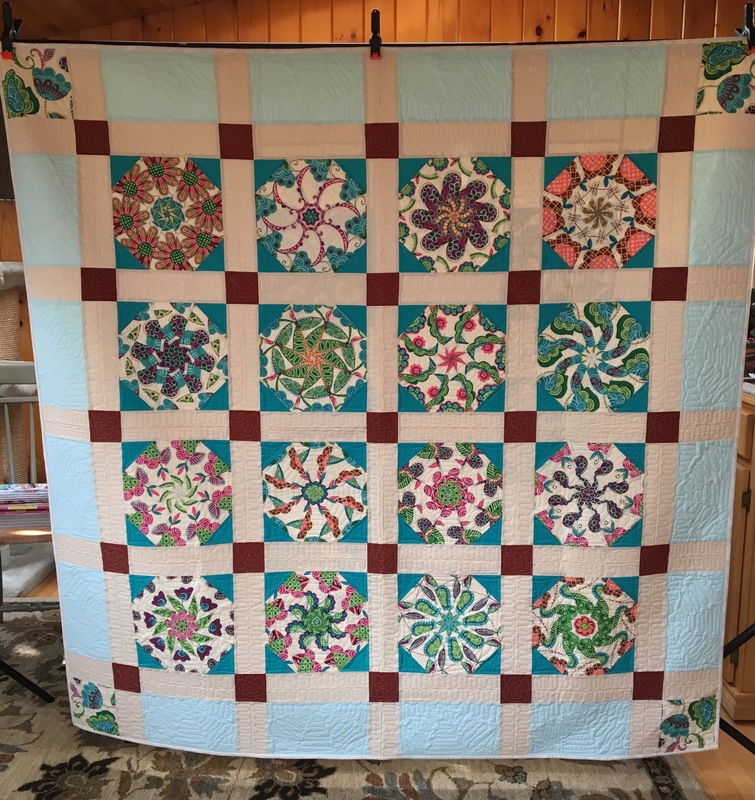 The blocks on this one are all fabric right side up which creates more of a spiral effect. 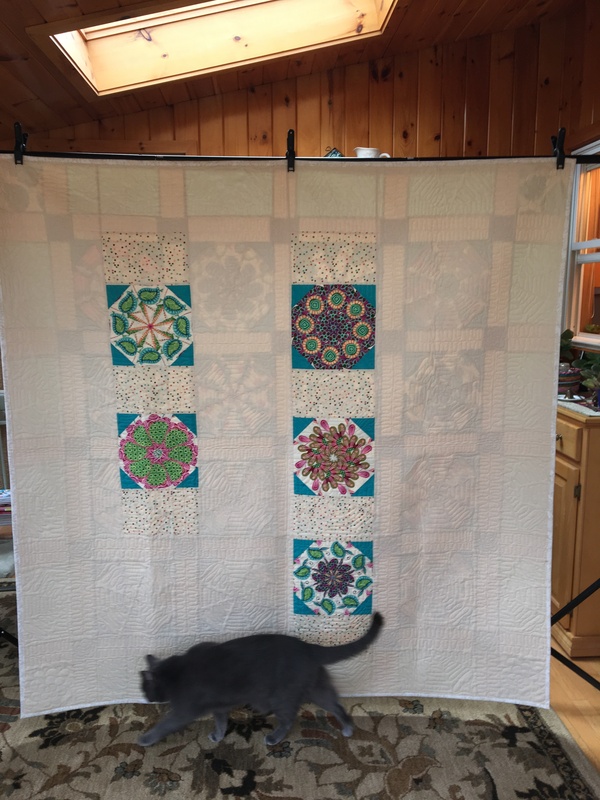 Pictures show the front and back of the quilt. The pattern is available for sale at Craftsy! And a couple more finished using the same fabric. 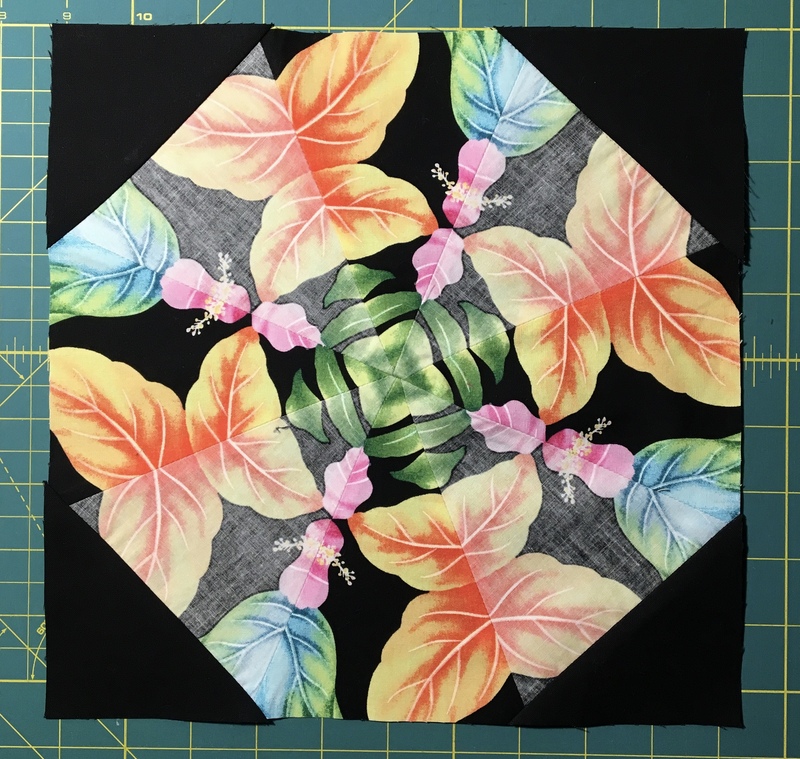 This entry was posted in Patterns, Quilts and tagged Kaleidoscope Quilt, pattern, Stack 'n Wack on May 1, 2017 by pmegio. Love love love these. 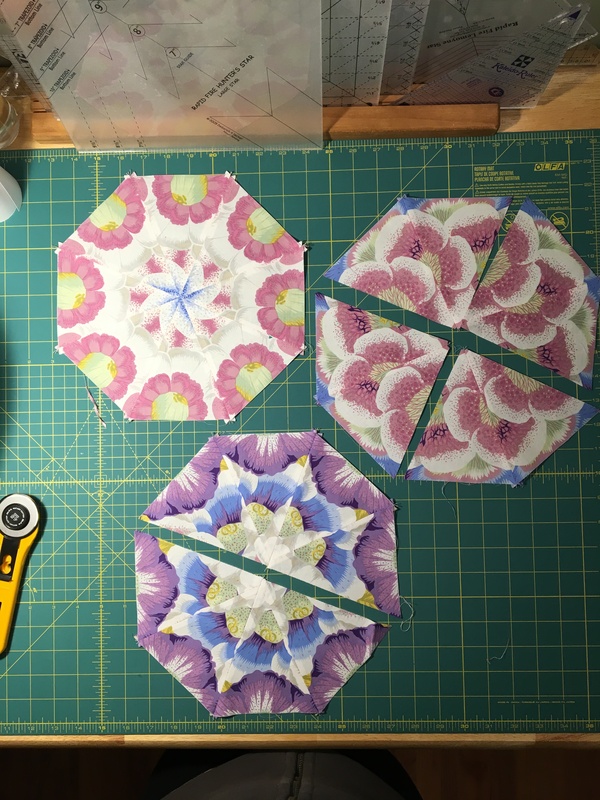 I made a one block wonder (similar idea) and can testify that the cutting and piecing precision are of the utmost importance. But WOW! Thank you for the tutorial. I have not used this method in many(!) years. It is a good refresher for a technique that I had forgotten.